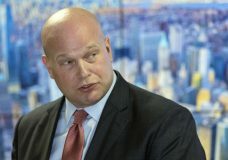 WASHINGTON — Former Acting Attorney General Matthew Whitaker remains at the Justice Department, but in a very different role. Whitaker, who last week appeared before the House Judiciary Committee, now works in the office of the associate attorney general. WASHINGTON — Acting Attorney General Matthew Whitaker has been advised by Justice Department ethics officials that he does not need to recuse himself from overseeing the special counsel’s Russia probe. WASHINGTON — Maryland is challenging the appointment of Matthew Whitaker as the new U.S. acting attorney general, arguing that President Donald Trump sidestepped the Constitution and the Justice Department’s own succession plan by elevating Whitaker to the top job. 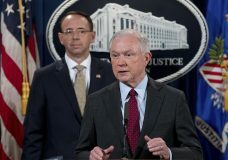 WASHINGTON — Attorney General Jeff Sessions was pushed out Wednesday as the country’s chief law enforcement officer after enduring more than a year of blistering and personal attacks from President Donald Trump over his recusal from the Russia investigation.